About IMC Pro Solutions | Do You Need Help With Your Social Media? When Verity and Alison (a.k.a The Girls In Pink) started IMC Pro Solutions they made the decision that they would be different. Their priority is the client, so rather than offering the basic customer service, they wanted to take them on a journey. They made the bold decision not to use scheduling tools. This meant more work and more time on their client’s accounts, but it was relevant, fresh and unique content rather than your bog-standard generic industry posts. They pride themselves on building a relationship with their clients and being available when needed. It was extremely important that each social media account is unique to the individual business and most importantly, it’s the voice of the people in the business. They take time to really understand the client and feel the same passion in order to portray them accurately online. 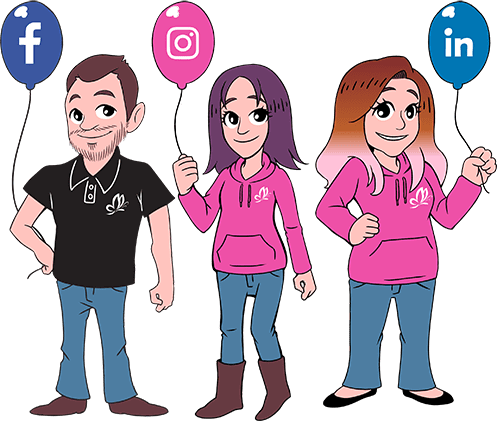 Their third director, Paul, came on board in February 2018 and he has been a superstar in taking their digital marketing services to the next level. They are on fire and rocking the world of social media, loving that their clients are right there with them!